Dionysius the Areopagite' was converted to Christianity by the preaching of St. Paul. Little is known about him, but his writings were extremely influential in the Middle Ages. Hugh, abbot of St-Victor in Paris, wrote a commentary on his treatise on the Heavenly Hierarchy. 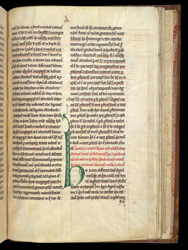 This manuscript of Hugh's commentary was written at the Cistercian Abbey of Kirkstead, in Lincolnshire. This simple but elegant initial 'H' is typical of the later 12th century; the use of green was to become relatively uncommon in the 13th century.